Or should I call it Rum Pumpkin Puree?! The field pumpkin I used for the Pumpkin, black bean and leek was rather generous in size. I had enough for at least four different meals. But not wanting to bake it or make a pumpkin soup. I decided on making some more preserves, jams and jellies for my store-cupboard. I’ve seen a number of recipes in cookbooks and on fellow bloggers blogs for pumpkin jam and pumpkin marmalade. I settled on one called French Pumpkin Jam purely for its simplicity, making a few minor changes to the original. In my head I thought this pumpkin jam would be similar to the Mulled Carrot Jam. It was not. I was not completely happy with what I had produced. It tastes okay a bit like chunky chestnut puree, but the smell is not particularly alluring. I don’t know if it is the niff of the rum or that I upped the quantity of cinnamon. Later, when I revisited the recipe, I learned what I had done something wrong. I had thrown all the ingredients into the pan. I was supposed to add the rum in the last two minutes of cooking. Oh well, we all make mistakes in the kitchen. It will not go to waste though, I have some ideas of how to consume it in the next few months or so, and it actually tastes fine, it’s just the alcoholic smell. If you want to make this, I'd say have a go. You only need 500g pumpkin, and you can happily omit the alcohol. For a vegan version, I did come across a recipe where you could substitute the honey with dried apricots and raisins. Put all into a preserving pan. Remove the zest from the lemon. In bowl, add cinnamon, granulated sugar, lemon zest, honey. Mix. Cook for about an hour. Stir regularly. Test if the jam has reached it setting point. If the jam gels at once, it is ready, otherwise continue until it is jammy. As soon as the jam is ready, spoon in the rum. Stir and cook over low heat for 2 minutes. Pour the hot jam into sterilized jars. Seal and store. Hey there can I ask a daft question - before you seal the jar - do you put in a bit of paper disk? I've heard folk do or don't - which do you find best. There's always next year with the seabuckthorn - tastes like a tangy peach/almost citrus-y. Bit of a thug to pick though - but worth it. Yum! 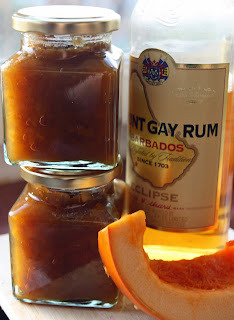 I rarely use alcohol when cooking but pumpkin & rum must go really well together! Of course you can, when I first started making jams I did, but found it made no difference to me. So later I stopped after reading other people making do without them inc chefs like HFW, plus they are a little expensive. So I haven't used waxed discs for at least five years. Your right about the seabuckthorn. They certainly were close to the twig that i would have wondered how to prize them off. I like the sound of how they taste, plus I did see a recipe somewhere of pumpkin jam with seabuckthorn. Me too, in fact I rarely cook with alochol. Thanks Eva. Hope you like, it more a puree than a jam though. But don't let that put you off. 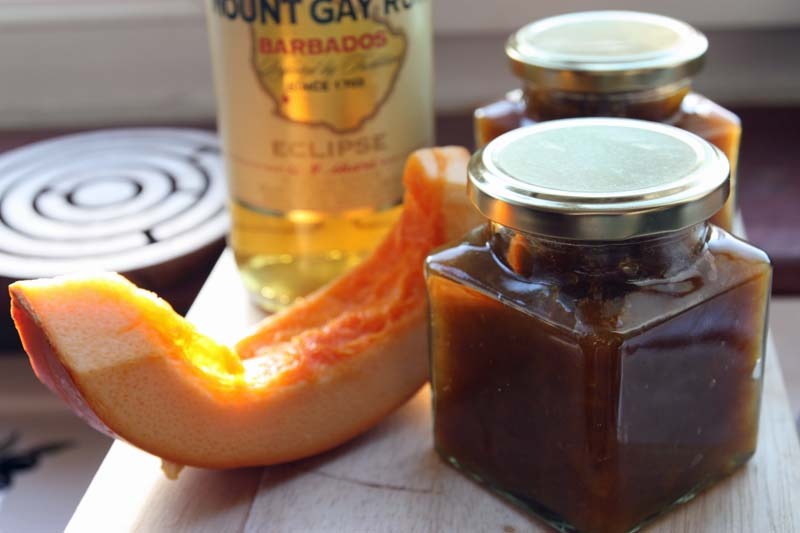 I would love to make pumpkin jam but it is something I would have to feel brave to make because I am not a big fan of jam - I just like the idea! Yum! Definitely going to turn some of the pumpkins my dad gave me into this, then sneak the jars into his Christmas hamper! Brilliant recipe, thanks for sharing! Although it is called Jam, I do think it is more puree-like. I assure you I won't be using this on toast, more on croissant - hence the French inspiration. Please do. I think it wil be a nice welcome change int he Chirstmas hamper. Hopefully, I will share ways of how to use it on my blog too. As long as you sterlize the jars and the lids well, you should be fine. I would encourage you to have a go, the more you try the confident you will become and make more and more:) Please do have a go, for you boys. I have never made jam, but this recipe has made me think that might be changing quite soon! MMMM,..Mangocheeks! This endresult says it all,..it looks divine! Hopefully when I get round to opening the jar, it will be enjoyed by all, inc. me.